In the tradition of Polo Ralph Lauren's craftsmanship and quality, this high quality Slim Long Sleeved Cotton Poplin Shirt is crafted from pure cotton in a tight poplin weave. A refined interpretation of a time-honoured classic, this shirt is constructed for a superior soft finish and tailored for ultimate comfort. 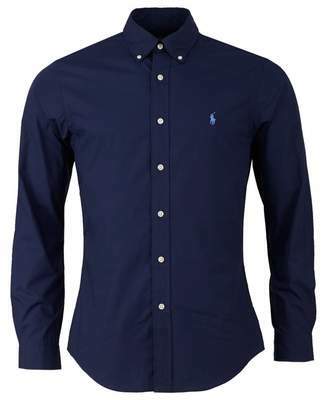 100% cotton Poplin weave Long sleeved Slim fit Curved hemline Button-down collar Rounded barrel cuffs Embroidered Ralph Lauren logo No darts Box pleat Split 2 piece yoke Machine wash Size and Fit Size photographed: medium Pit to pit: 20"